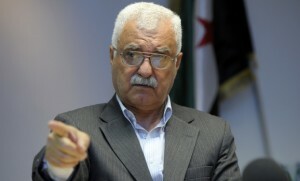 He urged the Arab League to adopt a tougher stance against Hezbollah’s intervention in Syria’s civil war. This comes after reports that the Free Syrian Army accused Hezbollah of occupying six Syrian villages on the Lebanese border. The occupation of the villages, according to an FSA spokesperson, followed clashes between Hezbollah and FSA forces along the border. The FSA on Thursday lashed out against what it said were Hezbollah hostilities and bombed the group’s positions inside Lebanon. Earlier last week, Hezbollah and Syrian rebels clashed on the Lebanon-Syria border, leaving at least 3 Hezbollah fighters dead. Hostilities between the rebels and the Iranian-backed Shi’ite militia continued on Sunday, as the FSA reported three long-range missiles were fired into Syria from the Hezbollah-controlled areas of Lebanon. This comes after a US report in the washington Post claimed that Iran and Hezbollah, its Lebanese proxy, are building a network of militias inside Syria to preserve and protect their interests in the event that President Bashar al-Assad’s government falls or is forced to retreat from Damascus. According to the report which was circulated early February , the militias are fighting alongside Syrian government forces to keep Assad in power. But officials think Iran’s long-term goal is to have reliable operatives in Syria in case the country fractures into ethnic and sectarian enclaves.